An authentic gift of prophecy: What is it? Who has it? Can you hear God's voice for yourself? In The Beginner's Guide to the Gift of Prophecy, Jack Deere describes the operation of the prophetic gift in the church today. He offers not only a balanced overview of the role of prophecy in the Christian community, but also practical information to help readers discern the authenticity of prophecies and learn to exercise the gift themselves. Topics covered include learning how God speaks, understanding His messages, avoiding prophetic craziness, giving prophetic messages, discerning deceptions, demons, and false prophets and growing in your prophetic gift. JACK DEERE brings practical wisdom to Christians through his teaching ministry, drawing from his experience as a professor at Dallas Theological Seminary, pastor of several churches, and author of bestselling books Surprised by the Power of the Spirit and Surprised by the Voice of God. He is dean of the extension schools in the Wagner Leadership Institute and executive director of Covenant Ministries International. 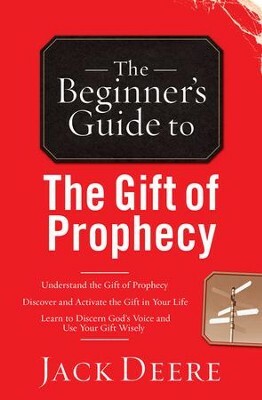 I'm the author/artist and I want to review Beginner's Guide to the Gift of Prophecy, The - eBook.